BraunAbility has been alongside Tom Turner longer than anyone else in his life, with the exception of his parents. For over 30 years he's relied on us for everything, whether camping in the Adirondacks or getting to his job as a deejay at his high school radio station or taking classes at his local community college. When you've been such an integral part of someone's life, you can't help wanting to spend some time with that person and find out just what it is that makes you such a good team. Born with Spina Bifida, Tom has no feeling beneath the belly button level. However, he's a strong man, using leg braces and a walker as his preferred method of mobility. He wasn't supposed to live past the age of four due to his condition, but he's alive and thrivingover 40 years later. Tom first became friends with BraunAbility in 1977 when he purchased a lift for his 1978 Chevrolet van. The lift lasted over 20years and could probably have hung on a few more years, but Tom was ready for a change. 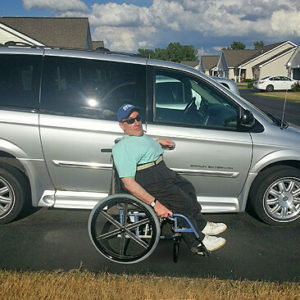 Over the next ten years he used two BraunAbility lifts in the same van, and would have stayed on that path had his physical therapist not introduced him to the BraunAbility Entervan. The year was 2007, and he immediately noticed the impact in his life. For one thing, since his mother was also using a wheelchair, the two of them could roll in and drive wherever they needed. "We go to dinner all the time," said Tom. "We go to concerts. 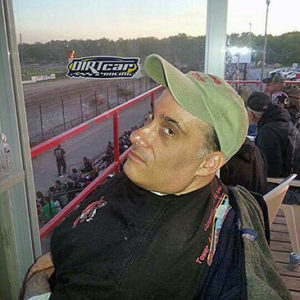 We go to the dirt races every Saturday night. With that van being so small, we can just pull right in, drop the ramp, and away we go." Before he realized it, he was becoming a part-time BraunAbility salesman, answering people's questions about how he bought it, how he enjoyed it, and what the buying process was like. Tom answered honestly, saying how easy it is to use and how helpful everyone was in securing financing for the vehicle. One memorable demonstration was to NASCAR Winston Cup Series driver Brett Bodine, who thought his father could really use a van to help him get around. "I said, 'Brett, don't wait. If you think that there's a need for something like that, by all means, do your research. "Though he couldn't say for sure, Tom is fairly certain Brett decided on an Entervan just like Tom's. Today Tom is still a devoted BraunAbility ambassador. He volunteers his time at the Center for Disability Rights in Rochester, NY. "They are the disability cops," he laughed. Through the center, he helps advocate on behalf of people with disabilities, issues with public policy, and peaceful protests at county office buildings. "Whenever there's a problem, they're right on top of it." Thank you, Tom, for stepping up to share how BraunAbility has been another member of your family for the past three decades. We enjoy being along for the (almost) life-long ride!